FX makes their official entrance into the mixed martial arts reality world tonight at 9PM ET/PT. “The Ultimate Fighter: Live” kicks off with a special two-and-a-half-hour premiere. There will be 16 live fights featured in Friday’s debut episode, with the winners earning a bed in the TUF house. The show will then air on every Friday for the next 12 weeks at 10PM ET/PT. A lightweight will secure his future by winning the tournament and scoring a six-figure UFC contract. The show’s 15th season will culminate on June 1st in a three-hour finale episode. 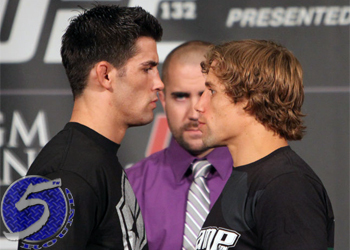 This season’s coaches are reigning bantamweight king Dominick Cruz and Urijah Faber (Pictured). The bitter rivals will collide July 7th at UFC 148 once filming wraps.